Apple restored Facebook's enterprise access roughly a day and a half after it was revoked, according to AppleInsider sources not authorized to speak on the matter. A Facebook spokesperson confirmed the change in a statement to Mike Isaac of The New York Times. "We have had our Enterprise Certification, which enables our internal employee applications, restored. We are in the process of getting our internal apps up and running," the spokesperson said. "To be clear, this didn't have an impact on our consumer-facing services." The lifting of Apple's ban allows Facebook to reinstate internal apps including corporate communications software, a transportation app and pre-release versions of public apps. Apple revoked Facebook's enterprise certificate on Wednesday after a report revealed the social media giant was illicitly using the system to conduct a data gathering program. Specifically, Facebook was paying users ages 13 to 35 to install a VPN app called Facebook Research on their iOS devices, allowing the company to closely monitor usage patterns. 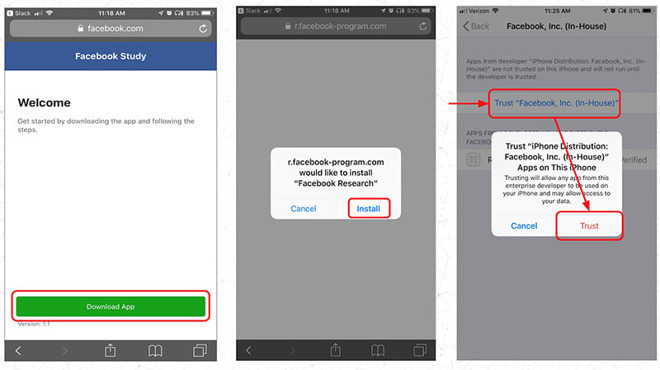 In what Apple characterized as a violation of its developer guidelines, Facebook Research relied on Enterprise Developer Certificates -- designed expressly to distribute private internal software -- to enable sideloading and root access into a user's device. Google is in a similar situation after its own data collection gambit, Screenwise Meter, was also found to rely on Apple's enterprise certificates. Earlier today, Apple disabled Google's access in much the same way as it handled Facebook's indiscretions. AppleInsider sources said Apple is working to restore Google's privileges, though a timeline for completion is unknown. Since they could have distributed the apps via Test Flight, the only reason they chose this route was root access they could not get going that route. So what changed in a day and half? Isn't that the paramount question to include in the article, even if there isn't an immediate answer? Well, also the limit on testflight # of users. You can bet Apple made some new rules and special hoops FB will have to jump through to prevent this occurring again. Heads up Google. Haven’t installed the Facebook app since I bought my iPhone 7 in 2016. Haven’t logged into Facebook since I bought my new MacBook Pro in 2017. Never installed Facebook messenger. Never ever ever ever ever had a Facebook account and I railed against both Facebook and MySpace back in the day when they both were the hot social networks on scene. I’m glad I never engaged in this privacy compromising foolishness. They didn't have to make new rules - facebook wasn't following the rules that were already in place. And this issue has nothing to do with Facebook users. Nothing to do with whether you use Facebook or not. It only has to do with Facebook employees who use iOS. Those employees could no longer install or launch private, internal apps being developed in house by Facebook. So your contribution has absolutely nothing to do with anything. I’m just stupefied by those who see Apple as the bad actor here. This take is all over the tech blogs. On MacRumors the comments are like 10-to-1 against Apple as abusing its power and how it shouldn’t be able to do this to a company and they hope everybody dumps their Apple products to teach Apple a lesson. Personally I think Apple should've taken more time to restore access. Same here...Stevo said (ca. 2012) FaceBook's requirements were 'onerous!' After reading that, I never went near FaceBook, Google, Twitter, MS, Amazon, or Yahoo! I preferred to pay for iLife, .Mac, iTunes, MacOS upgrades, etc., etc. ...So your contribution has absolutely nothing to do with anything. Would have causes significant disruption to both Google and FB. That is what I hate about ad companies, invasion of privacy. No longer content to sending people to the street to collect polls, internet companies mine your data over and over again. Happy I sold my FB stock today (nothing related to this). Finally. Not sure what thread you’re referring to on MR, but the one I’ve seen is running about 10 to 1 against Facebook. Like it or not, Facebook enables the individual to keep in touch with many folks in a social-media setting. I use it constantly for my friends, business, and a lot of forums for exchanging ideas. Used responsibly, it has more pluses than minuses for me and countless others. More people use Facebook than not. You guys are in a vocal minority. That being said, people that do use it need to realize that nothing is "free". Whatever they put out there for the world to see/read is out there and people monetize on that. If Facebook wants to find out (or sell) my data that shows I like cute puppy videos, I couldn't care less. I carefully curate my FB interaction so nothing is out there that can haunt me in some way. The media and haters like to make it sound like Facebook sells your financial information when there's a breach which is patently false. If you post something on the internet, anywhere, assume it's public knowledge and move on. If shops like Facebook, Twitter, Instagram, and even Google started offering plans for say $5 per month to guarantee 100% privacy, would you or anyone else pay for that? I highly doubt it, yet folks get angry when a "free" services to them monetizes the information they themselves put out there. What Facebook and Google did with the certificate abuse was wrong, and they should have gotten more severe punishment, but the rest of the information-leaking nonsense is a joke. As I've said in the past, I am more angry at the Equifax breach (and non-action by congress) than I am of any leak that Facebook had. It's a big ruckus about nothing. Hope this convinces you to never again read comments on MR. It's like asking a random stranger to gouge out your eyes. Everyday is a new day to better ourselves, share the message, & change the world back it’s true nature. How about Apple revoking the public certificates of Facebook and Google "by mistake" and take few days to correct it? That was way to fast. What kind of weak punishment was that? It’s not the first Time Facebook took things to far. Apple couldn’t wait at least a week? So Facebook has really learned nothing. I personally believe Apple did this just to show the impact if this happens again. Both companies need each other too much to let this spiral out of control. Like it or not, many people would get rid of their iOS devices if the Facebook nonsense was removed. WhatsApp, Instagram, Messenger, and the main app are like oxygen for many people. And without iOS, how much are those ads really worth on Facebook given the historical difference between Android and iOS revenue per user? But for the record, I think Facebook is awful and the leadership is corrupt. I did some brief consulting out there when I worked for a consulting firm and it was like a cult.